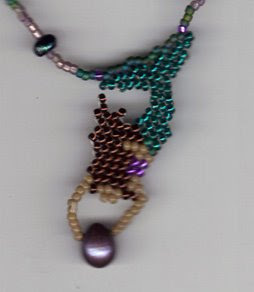 i recently pulled out my beads for another attempt at beading. Of course, i still haven't finished the dolls...and i have a whole bin full of half finished crocheted projects that still need finished. :) hee hee. i'm trying though, trying to find the inspiration..trying to get back some of my craft passion... trying to find the time while juggling everything else in my life. As much as i would love to jump right into making a big gorgeous necklace, i knew i needed to start small. So i dug out a few of my old basic patterns. i have always loved to make these 'pearl divers'. Basic doesn't mean easy, these little ladies caused me a lot of frustration as i tried to counted out beads, and then recounted beads...lol. Still, it was a good way to try to get back into it. Not a bad start, three girls done. 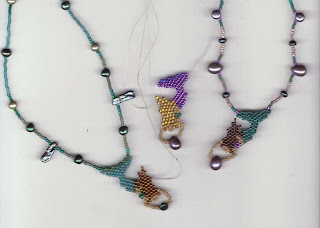 One necklace finished, one almost finished..and one to go. i couldn't seem to get a non-blurry picture, so this will have to do. 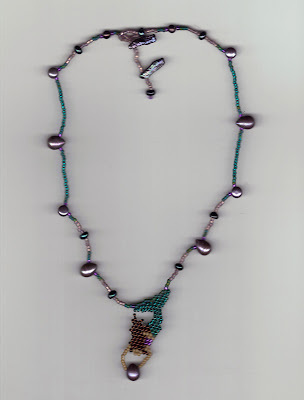 She is holding a fresh water pearl and the necklace is created using a combination of seed beads and fresh water pearls in a variety of shapes and sizes.